-God, I could watch this video of Anne Hathaway shading James Franco for hanging her out to dry at the Oscars on repeat for a month. –Chris Pratt responded to Ellen Page‘s criticism of his church with a long-winded, poorly designed IG story. -Congrats to Supergirl’s Melissa Benoist, who announced her engagement to former costar Chris Wood. -Fleabag season 2 is starting in March. -Hulu also previewed the new Veronica Mars reboot, promising a more mature take. -The official website for Captain Marvel (which is set in the 90s) looks like it was built on Angelfire and it’s total perfection! -The BAFTAs took place in London this weekend, and Olivia Colman gave another perfect speech (“We’re gonna get so pissed later!”) while Cate Blanchett looked like she was collecting infinity stones. –Trevor Noah‘s thoughts on the Liam Neeson debacle are worth a listen. -As part of her cover story with Justin, Hailey Baldwin answered Vogue’s 73 questions. It’s awkwardly stiff. –Chris Brown needs to stay the hell away from Cardi B. And, you know, everyone else. -I really liked this profile on Roma’s Yalitza Aparicio, which challenges the fairy tale narrative that’s been building all season. -Did Sean Penn really write a column about how Bradley Cooper should have been nominated for Best Director? Really?! It’s his FIRST movie! I would have rather seen Destroyer’s Karyn Kusama or Can You Ever Forgive Me?’s Marielle Heller get a nom before Cooper. -Oscars is relegating four categories to commercial breaks, including editing and cinematography. You know, that things that actually make movies good. -No surprise here: Bryan Singer‘s Red Sonja has been put on the back burner. –Lin-Manuel Miranda will guest star on Brooklyn Nine-Nine. He basically tweeted that show into survival, so this is lovely. -It looks like Warner Bros is actually going to pull Friends from Netflix for their own streaming app. -Did you miss the Grammys last night? Here’s the red carpet recap. -Last night during the Grammys, we got our first look at Will Smith as the blue genie in Disney’s live-action adaptation of Aladdin — and it’s really, really bad. The teaser launched a million Arrested Development jokes. 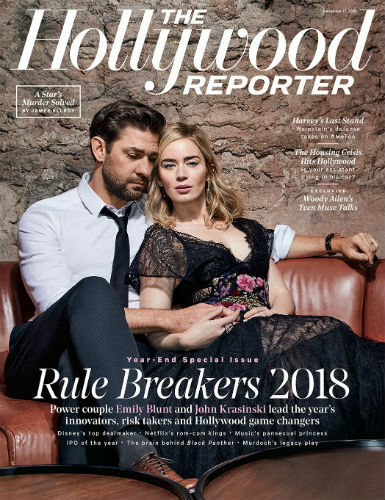 -I’m not quite sure why the Hollywood Reporter opted to do a joint interview with Emily Blunt and John Krasinski. She’s promoting Mary Poppins and he’s promoting — the second season of his Amazon show that doesn’t yet have a release date? Maybe? Also, out of all the photos, the cover is my least favourite. (How could they not choose the coat one!?!) Still, they’re pretty damn adorable together. She calls him Kras! -The best part about Cardi B’s Carpool Karaoke segment is that there were no surprise interruptions by Offset (followed by her flirting with senior citizens). -Aww man, Penny Marshall passed away at 75. Celebs are tweeting their memories and condolences. Time for a rewatch of A League of Their Own! -Saturday Night Live creator Lorne Michaels is reportedly sending Pete Davidson to get help following his suicide scare over the weekend. –Oprah has jumped on the Black Panther Oscar campaign. I approve! –Sandra Bullock has no interest in Oscar hosting. Can’t say I blame her. -Meanwhile, Sandra’s outfits on her Bird Box press tour have been lit. -According to Nielsen, the Roseanne reboot was the most-watched regularly scheduled TV program in 2018, with an average 19.9 million viewers over its run, followed by Sunday Night Football, Big Bang Theory, NCIS and This Is Us. Society is doomed. –Angelina Jolie penned an op-ed in The Economist, urging global leaders to act on the refugee crisis. -This is a really interesting (and shade-filled!) look at why Divergent — which was supposed to be the next Hunger Games — flamed out so spectacularly. -Man, everyone on my Twitter feed is obsessed with this Turkish show. OB.SESS.ED. –Lin Manuel-Miranda and Jimmy Fallon performed holiday parodies of the year’s hits and it was very cute. -There’s no Doctor Who holiday special this year, so they made up for it with this animated short instead. -This trailer for Scott Foley and Lauren Cohan‘s new ABC series is delightful! -Netflix ordered more episodes of Sabrina, so I guess that’s a thing now. –Cate Blanchett stars in the Where’d You Go, Bernadette? trailer. I LOVED that book and this cast is very promising. –Billy Eichner hit the street with Hamilton star Lin-Manuel Miranda, and the whole video is happy-making. Billy’s face when he says “you make Garfield fan art? !” kills me in every way. –Emma Watson shared a photo from the Little Women set and dammit if it didn’t make me a little tingly. –Julie Andrews‘ granddaughter claims she had an affair with Dax Shepard in 2009 — two years after he started dating Kristen Bell. He is disputing how old the photos she released really are, and pointed out that she’s previously sold stories to the tabs about Matthew Perry, Jack Osbourne and Kid Rock. –Taylor Swift is using facial recognition software to detect stalkers at her concert like she’s in CSI or something, and I effing love this. -The headline of NYT’s new profile “Ellen Degeneres Is Not As Nice As You Think” made me think they were diving into some of the blind items about her, but it turns out they’re just being cheeky. -Meanwhile, I really like this article on how blind items have become more influential during the #MeToo movement and can kick off blockbuster investigations. –Cybil Shepherd says that she once declined Les Moovnes advances — and her show was promptly canceled. –Hailee Steinfeld and Niall Horan broke up after nearly a year together. This would probably have more impact if I knew they were dating. –Jason Momoa performed a Haka dance at the Aquaman premiere and it was pretty damn glorious. -Grey, meet Grey. Jennifer Grey is coming to Grey’s Anatomy in a mysterious new role. –Jennifer Garner and J.J. Abrams will reunite for a one-hour drama coming to Apple, joining their massive list of projects with huge stars and no public plan about distribution. -FX released its annual report about scripted TV, and tallied a record 495 original scripted streaming, cable, and broadcast series were released in 2018. -I adore this story about how 10 Things I Hate About You was written largely through snail mail. -Whoo boy. This thread does not make me want to see Clint Eastwood‘s new movie The Mule anytime soon. -I wouldn’t be surprised if Marvel didn’t relinquish the reigns of their big action set pieces — female director or not. –Matthias Schoenaerts stars in the trailer for The Mustang as a violent criminal who is given the chance to participate in a rehabilitation therapy program involving the training of wild mustangs. I’ll watch that guy in anything so why not?